Sometimes I get inspiration to make a dish, and I make it…THAT day. Other times inspiration stews for a few weeks and I have to run into variations on that inspiration a few times, before I get the energy/ingredients/time/occasion to do it. I’ve seen a few food blogs suggesting ideas for macaroni and cheese adding butternut squash, as well as the usual suspects. Then my mother-in-law mentioned on their recent trip to the east coast, they made a mac ‘n’ cheese using some cottage cheese. That sounded like a stellar idea to bring a ton of protein into a dish that’s usually just loaded with fat and simple carbohydrates. The one cup of cottage cheese I used in this dish added 26 grams of protein. The other reason I liked the idea was that I am pretty particular about substitutions. No “light” cookies, “fat free” mayo, “reduced fat” cheese “diet” sodas or “low calorie” ice cream for me. I am of the strong opinion, that if I’m going to put it (whatever it is), in my body, I want it to be made the way it was intended…as naturally occurring as possible. Ugh, remember that horrible fat substitute, Olestra? Talk about a bad idea. So, my long standing philosophy is to eat real food, no gimmicks and incorporate as many fruits, veggies and whole complex carbohydrates into my meals as possible. Why delude yourself, suffering through a fat free, sugar free, taste free dessert, when you can enjoy a small decadent treat of triple chocolate cookies? So when Marc’s mom had some leftover Panko bread crumbs from a Thanksgiving green bean dish, that was the impetus I needed to make my own improvised version of mac and cheese. I realized the only cheddar we had was Spring Hill Jersey sage cheddar, and figured that would do. Then I got a flash of inspiration since one of my favorite pasta dishes is pumpkin ravioli served in brown butter and sage, and garnished with parmesan. Then, the sage became a more deliberate ingredient when I remembered we had fresh local sage left over from T-Day as well, so even more sage went in. It was utterly heavenly. The smell of the ingredients at each step, and the creamy mac and cheese with the crunchy panko topping, were awesome. The combination of the hint of sweetness from the squash, with the sharp cheddar and aromatic sage was unbelievably good. It was a multi step process, but the end result was so fantastic, I will definitely make it again…soon. As with most of my “recipes” this is really a rough guide. Feel free to play with it depending on what pasta you have around, what cheese is in your fridge, and what type of squash your local farmers are growing. And as usual, please incorporate as many local/sustainable/organic ingredients as you can. I strongly recommend using as many local organic ingredients as possible. Preheat oven to 350 degrees and cut squash in half. Scoop out the seeds and cut into thick wedges (2 inches wide). Spread out in large baking dish (9×13 is good size) and drizzle with olive oil and a little salt. Cover with foil and bake about 30 minutes, until tender. Remove foil and roast another 15 minutes or so until squash develops some golden color and the liquid in the pan from the squash has evaporated. This step will bring out the sweetness in the squash and dry it out a little so your final cheese sauce won’t be runny. When the squash is cool enough to work with, cut off and discard the peel. Meanwhile, boil a large pot of water, and add a liberal amount of salt to it since this is your only chance to salt the pasta directly. Cook pasta according to package instructions, drain, add a little butter, so it doesn’t clump while you prepare the cheese sauce. Mash, or blend the squash and cottage cheese in a food processor, just long enough to smooth the consistency, and set aside. Over medium heat, in a large pan with a little olive oil, sauté onion until soft and golden, add the garlic and let it sauté for 30 seconds to 1 minute (until you smell it, but don’t burn it). Then add 3 Tbs. butter. Wait for it to melt, add flour, stirring vigorously and continuously. When the onion/garlic/fat/flour mixture reaches a blondish color, (rather than white from the flour) you have a roux, which will thicken the sauce. Be patient with the roux and don’t turn up the heat, because it can burn, and you’d have to start all over with the onions. Slowly add the milk, stirring (or whisking) the whole time so you don’t develop lumps. 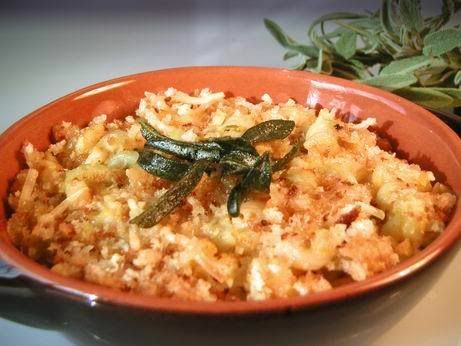 When it is totally incorporated, and has thickened, melt the grated cheese into this thickened onion/roux/milk sauce. 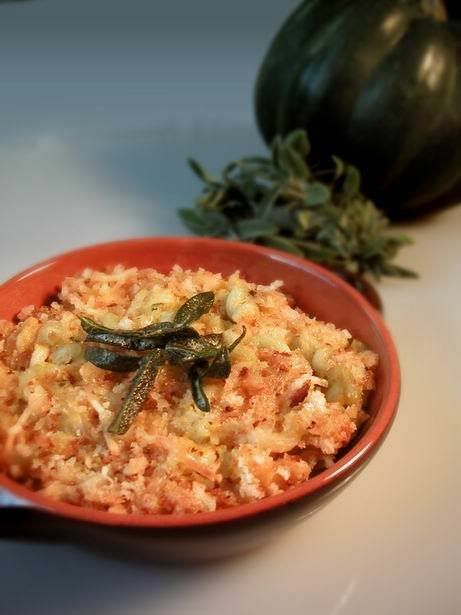 Incorporate everything well, turn off the heat, add squash/cottage cheese mixture, nutmeg, chopped sage, salt and pepper. Taste it for seasoning. It should be divine. If not, add more seasoning. Carefully mix the cooked pasta into the sauce, and taste again for seasoning. Scrape up any squash bits in the bottom of that baking dish you used, and use a little butter to grease the bottom, if there isn’t enough olive oil left on it. In a bowl, mix the panko bread crumbs, and parmesan. Spread the mac and cheese evenly into the baking dish and top with the panko and parmesan mixture. Bake uncovered for 30-35 minutes in the 350 degree oven, until it is golden and crispy on top, and the cheese sauce is bubbling from underneath. It will be very hot, so for your tongue’s sake, please let it cool off for about 15 minutes…I know it will be hard to wait since your whole house will smell heavenly. While the mac and cheese is cooling, melt about 2 tablespoons of butter on medium-low heat, in a very small pan. It will start to bubble and make a lot of noise, once it starts to settle down (in about one minute), add the fresh, whole sage leaves and the butter will quickly become browned. The sage will pop and crisp and will only take about one more minute to become a darker green, but not brown. Take it off the heat and garnish the crisp (though make sure they aren’t burnt) sage leaves on each serving of the mac and cheese. If the sage or butter burns, throw it out, and start over with more butter and sage. Served with a fresh salad or sautéed winter greens on the side, it’s a fun healthier twist on an old favorite, but there’s still plenty of indulgence. Oh, oh, oh! I am SO making that this weekend with my last farmers’ market acorn squash and maybe the last of the Gruyere cheese. Mmmm… comfort food! Jennifer – Glad I could tempt you so. Gruyere, of course would be wonderful. I’d love to know what you end up doing, and how it comes out for you. Thanks so much for stopping by! Bri, this is a wonderful idea! You have just made mac ‘n’ cheese appealing to me! This is a WONDERFUL idea! I wish I had thought of it myself. I love all of these flavors. Can’t wait to try it out. This looks great! I LOVE acorn squash — I bet it would be delicious. Erin – Thanks! Let me know if you do try it out. Squash sage and brown butter just go so well together, so add in a little cheese and pasta, and you’ve got yourself a party. Thanks for dropping by! Katy – Thank you. I love winter squash, so this just seemed like a good direction to take it. Patricia – Thanks! Yeah, traditional mac and cheese can be too heavy and unappetizing, so I’m glad I could make a dish that made it more appealing to you. Thanks for your comment! That is so food that people want to eat. Graeme – Thanks! We certainly thought it was a winner dish to stumble on. My only regret was that we didn’t have more leftovers. ooh – nutmeg and fried sage leaves? deelish! i am curious to know what the texture was like in this dish. Wow, that’s brilliant. Thanks for the “rough” recipe… I’ll just run with the concept and do it my own way, but: Sage and squash in mac’n’cheese? Brilliant. Gigi – I bought more acorn squash this week at the farmers market so I could make it again. I’m hooked. The flavors were so amazing together. Since I blended the cottage cheese and squash, the got really smooth, and mixed into the cheese sauce well. So, the texture around the noodles was really creamy, and the panko breadcrumbs were nice and crispy. Cookiecrumb – Thanks! Yes, run with it. I’d love to know what you do with it, and how it comes out. The sage and the squash really make it. Oh, Bri, I finally got around to making this after being down with a dreadful respiratory infection and unable to ingest dairy. WOW. What a way to come back to life! I made just half a batch (with the Gruyere, what a way to live!) and shared it with a friend, and we cleaned out the casserole. Sooooooooo good! Jennifer – Yay! I’m so glad you got a chance to make the squash mac n cheese. I don’t think I’ll ever be able to make plain ole mac n cheese again. I’m thrilled you enjoyed it and shared with a friend. Sorry you got so sick, but I’m glad you are feeling better (definitely a good idea to stay away from dairy in the meantime). Thanks so much for taking the time to comment about it! Hi! Tom ~ Oooh, isn’t this mac ‘n cheese…yummy delicious! One of Bri’s BEST creations IMO. Glad you gave it a try….and enjoyed it! Thanks for letting us know.